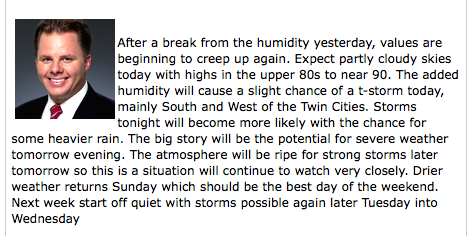 The Minnesota Forecaster: Severe Saturday? The SPC Day 2 outlook shows it well, Last night I was thinking the hwy 10 I-94 corridor would be the hot spot, so just NW of the metro mid to late afternoon, the metro should see threatening skies in the late afternoon, early evening. Needless to say those getting out of the twins game, and those going to the concert and fireworks need to be aware of their surroundings. Bill has posted a link to the SPC site, take a look at the probabilistic tap. Tornado watch for eastern Montana! There are a TON of sites with weather data and maps like this. I have often thought of creating an aggregator site to collect links and other things to get easy access to all of it, but gave up because there's just so much. Find somebody to help you along with the creation of your site. It is the best way to do what you want to do. I can't help you with the site, but if you have questions, just ask here, and We will gladly help you. what is more interesting is who you trust for you information? I really like Novak. He is brief but gives it all that you need. So when does the TV guys become irrelevant and alternative become the better source? I trust Novak a lot. He is most likely correct and said this two days ago. 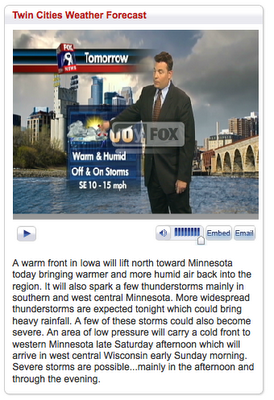 I think television forecasters are dying a slow death. Look no further than how Paul Douglas has reinvented himself with new media. Novak gives you what you need without all the unnecessary glitz. OK, for starters, where can I find the source for this graph? Group of splitting t-stoms going towards MPX. Keep an eye to the sky! That site links to text-based BUFKITs (whatever that is), but no graphs. Big old bow echo heading for Bismarck right now. Given it is a summer weekend and two major outdoor events (U2 and Twins) going on monitoring the weather should definitely be done. Saturday morning TV weather casts will be critical as folks plan their day. 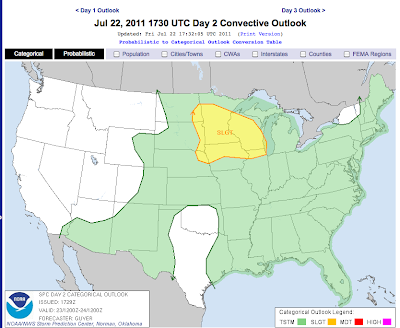 Conditions look very favorable for severe weather as many parameters come into play. Instabilities are very significant with just a sneeze in the atmosphere needed to trigger storms. TV wx casters, online mediums and good ole NOAA Wx radio -- all relevant. Every indication is that we're going to get 3-5 hours of rain/thunder this morning. Shouldn't that reduce the chance for severe this afternoon? I'd certainly take the stormy morning as a possible good sign if I were a U2 fan. But the storms have moved off to the east. For now anyway. By "no such luck" are you NOT wanting storms? YES. A person would be crazy to want severe t-storm, unless he or she wanted their house destroyed, or he or she was a storm chaser. Mabye I should of clarified that I was commenting on AB's comment. I'm a weather geek and most seem to like severe storms. We wouldn't follow the weather if it was boring. Let me clarify a bit more. I love watching red blobs float across a radar screen, I just dont like the red squares over where I live. Running out of time here. Not much happening.